HFCs are the fastest growing greenhouse gases in much of the world. HFCs have caused only 1% of total global warming to date, but production, consumption, and emissions of these factory-made gases are growing at a rate of 10-15% per year, which will cause a doubling every five to seven years (Velders G. J. M, et al. 2012). HFCs are factory-made gases primarily produced for use in refrigeration, air-conditioning, insulating foams, and aerosol propellants. Growth is accelerating as HFCs are used to replace chlorofluorocarbons (CFCs), which were previously phased out under the Montreal Protocol, and hydrochlorofluorocarbons (HCFCs), which are now being phased out (see Figure 1). HFCs were once thought necessary to replace ozone-depleting substances, but today are no longer needed in most sectors. HFCs are considered short-lived climate pollutants, as they remain in the atmosphere for just days to a few decades, unlike long-lived CO2 emissions, which remain in the atmosphere for hundreds to thousands of years. The benefits of reducing short-lived climate pollutants, which contribute 40-45% to the current warming rate, can be felt within days to a decade of mitigation. Fast action to reduce short-lived climate pollutants cut can the rate of warming in half by mid-century. 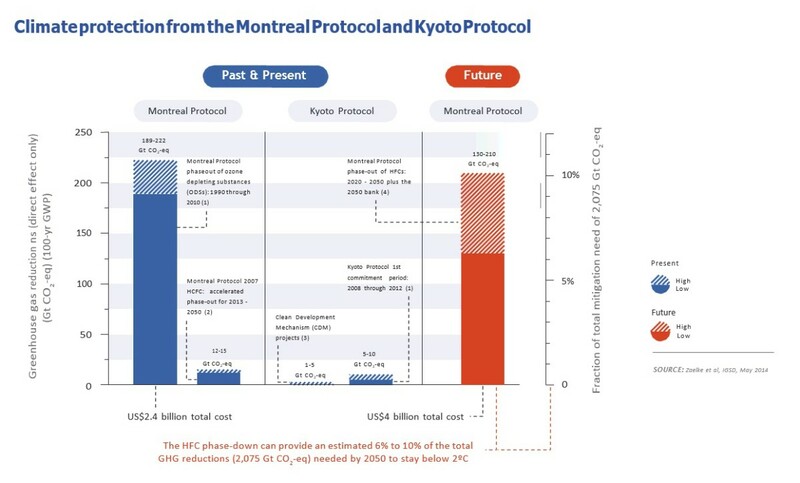 At the international level, there is growing consensus that HFCs can be most effectively controlled through the phasedown of their production and consumption under the Montreal Protocol as a complement to controls of emissions under the Kyoto Protocol. The Montreal Protocol has the experience and expertise to ensure a fast, effective, and efficient phasedown of HFCs, which are in the same family of gases, have similar chemical properties, and are used in the same sectors as the CFCs already phased out and the HCFCs currently being phased out. (Zaelke et al. 2012). Because many ODSs are also potent greenhouse gases, their phase-out under the Montreal Protocol has provided an often overlooked bonus for climate mitigation: Phasing out these 100 chemicals also has provided powerful climate protection, avoiding the equivalent of an estimated 9.5 billion tonnes of CO2 emissions per year – approximately five times more than the emissions reductions of the Kyoto Protocol’s first commitment period (2008-2012) (see Figure 2). 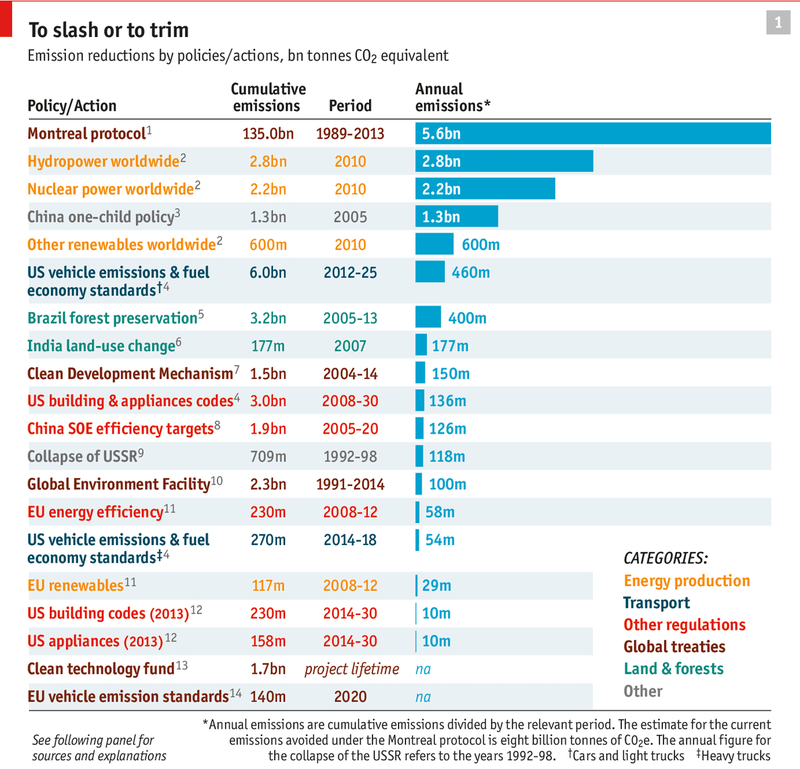 The Economist recently named the Montreal Protocol number one in policies that have done the most to slow global warming to date, ahead of hydro, nuclear, and renewables (see Figure 3). Fast mitigation of HFCs combined with mitigation of the other short-lived climate pollutants (SLCPs) — black carbon, methane, and tropospheric ozone — can avoid 0.6°C of future warming by 2050, and up to 1.5°C by end-of-century, with HFC mitigation contributing one-third of the avoided warming by end-of-century (Xu et al. 2013). Reducing HFCs and the other SLCPs can significantly reduce future climate impacts, including slowing sea-level rise. Research led by Professor Veerabhadran Ramanathan at Scripps Institution of Oceanography, University of California, San Diego, calculates that cutting SLCPs can reduce the rate of sea-level rise by almost 20% by 2050 and nearly 25% by 2100; adding immediate and aggressive CO2 mitigation can double the end-of-century reductions (see Figure 4). Improving energy efficiency of air conditioners in parallel with the HFC phase down could avoid up to 100 billion tonnes of CO2, at least doubling the mitigation benefits from a phasedown alone. In addition to the direct climate benefits from HFC mitigation, a global HFC phasedown will catalyze additional climate benefits through improvements in the energy efficiency of refrigerators, air conditioners, and other products and equipment that use HFC refrigerants. (Complementary measures that encourage consumer choice of energy efficient appliances can speed the gains.) These efficiency gains will significantly reduce CO2 emissions. The phaseout of CFCs under the Montreal Protocol, which began in the mid-1980s, catalyzed substantial improvements in air conditioning and refrigerant energy efficiency—up to 60% in some subsectors. These efficiency improvements were the result of replacing old products and equipment with a new generation of higher efficiency machines (US EPA, 2012). Recent calculations by scientists at Lawrence Berkeley National Laboratory confirm that, in the room air conditioning sector, improving efficiency could avoid ~25 Gt of CO2 emissions in 2030, 33 Gt in 2040, and ~40 Gt in 2050, for cumulative mitigation up to 98 Gt. (Shah, et al. 2015). Slowing the rate of global warming over the near term by cutting short-lived climate pollutants to complement carbon dioxide reductions for the long term.